Authorities are trying to identify a man who strolled into a Bristow, Okla., Wal-Mart Saturday morning dressed as an armored-truck driver and walked out $75,000 richer, NBC New York reports. According to the report, Bristow Police Chief Wayne Williams said that his department has received some anonymous tips from northeast Oklahoma pertaining to the identity of the man, who had a cap low on his face as he was captured by surveillance footage. "We've got some calls out on it, but nothing yet," Williams said. The suspect walked into the store around 10:30 a.m., strolled into the cash office, signed for the hefty deposit, and then simply walked out of the store and drove away in a four-door Chevrolet. 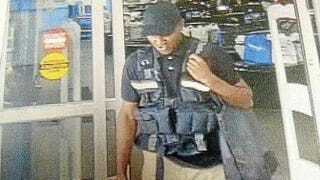 "He came to the Wal-Mart kind of dressed like a Loomis armored-car driver," Williams said. The deception was only noted when the real Loomis employee arrived at the store 45 minutes later.